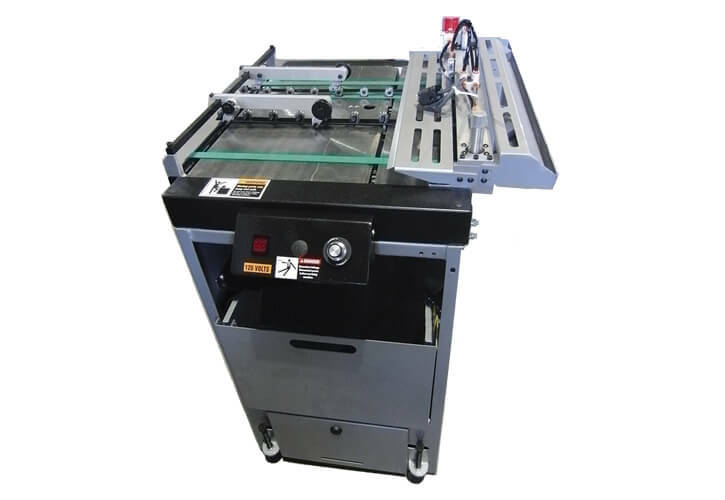 Use the KR837V divert system whenever individual pieces need to be removed from a continuous flow of product on a KR inkjet base. Control it with an inkjet, KR 895 pattern vision system, camera or barcode reader. 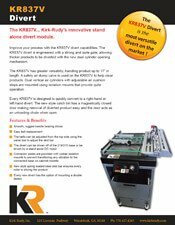 Mounts onto any KR215 or KR219 style transport and can be added in the field. An electric solenoid or compressed air cylinder operates the divert mechanism. Product is diverted into a catch tray that mounts onto the end of the cabinet. The picture shows the divert assembly mounted onto the end of a KR215 IJ base. Product flow is left to right. The belts on the divert assembly are driven by the out feed roller on the KR215 or KR219 transport. The divert system works best with thin, flexible product. Inflexible material may not divert properly.